I’m going to be presenting a revised version of my WordPress Customizer talk from Montreal at WordCamp Toronto on October 4th. In WordPress 4.1 the “Theme Customizer” was changed to the “Customizer” with the intent that it could be used as the interface for any settings for customizing WordPress themes or plugins. Very few developers are taking advantage of this built-in options panel. Through some examples, we will see how easy it is to use the Customizer API. Hope to see you in Toronto, for yet another great WordCamp. I’m really pleased to be a speaker at WordCamp Toronto 2014. If you use WordPress and have not been to a WordCamp, you should plan to attend one. WordCamps are great events at which to learn a lot about WordPress and meet people interested in and knowledgeable in WordPress. We’ll be having one in Ottawa in the spring. This talk is about creating a multilingual WordPress site using WordPress multisite. The talk will cover: the basics of setting up multisite, some plugins to make it easier to create a multilingual site, pros & cons of using multisite for multilingual sites, and some tips and tricks to help with your sites. I’m really excited to be presenting Introduction to WordPress jointly with one of my WordCamp Co-organizers, Jasmine Vesque, at WordCamp Ottawa this year. It’s going to add a new dimension to a presentation I’ve been doing for a few years now. WordCamp Ottawa 2013: Getting WordPress to speak your language. 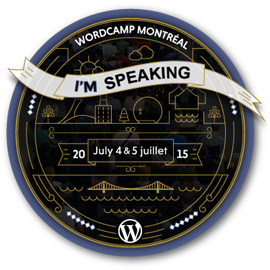 In addition to organizing, I’m going to be speaking at WordCamp Ottawa, twice! WordPress is available in 77 languages or variants, but how do you get it to show something other than English? This session will show you how to create sites in a language other than English, and sites with multiple languages. We will set up a WordPress site that is not English and learn what to look for in themes and plugins to be able to use them with other languages. We will review the different strategies and options for creating multilingual sites, from simple sites with custom themes, to multilingual plugins and multi-site installs, and the issues related to each approach. Prerequisites: To get the most from the talk, some experience with changing settings, installing plugins, FTP/uploading files to your WordPress install, and editing configuration files would be an asset, but it is not required. This session is an introduction to WordPress intended to help those who are beginners/new to WordPress become acquainted with WordPress, it’s concepts and vocabulary before the main sessions. We will: learn about what WordPress is, see who uses it, get acquainted with the WordPress dashboard, and learn about the different content types and how to add content, including images and video. We will also see how to add and manage menus, sidebar widgets, themes and plugins. Getting a WordCamp in Ottawa is something that I’ve been involved in for a couple of years. It’s really great to see that it’s finally going to happen! Registration for WordCamp Ottawa 2013 will open March 1st. Stay tuned for the announcement! You can also follow the Ottawa WordPress Group on Twitter, Facebook and LinkedIn or visit 2013.ottawa.wordcamp.org for more information. Tickets for WordCamp Ottawa will be $20 – $25 per person.